Ugly windows look bad from the road, and nine-out-of-ten times that’s why people call replacement window contractors. Never mind the ever increasing heating bills or cooling costs, or the fact that poorly insulated windows leak air and water and can allow insects and rodents into the home, its usually the cosmetic appeal of new windows that compels homeowners to contemplate hiring out our window replacement service. Beware the package deals where discount windows and doors come with additional installation service costs not included in the original quote; this is where they get you! Smart consumers acquire high quality thermal insulated windows separately, and then contract Eastview Homes to install the new units on their property. 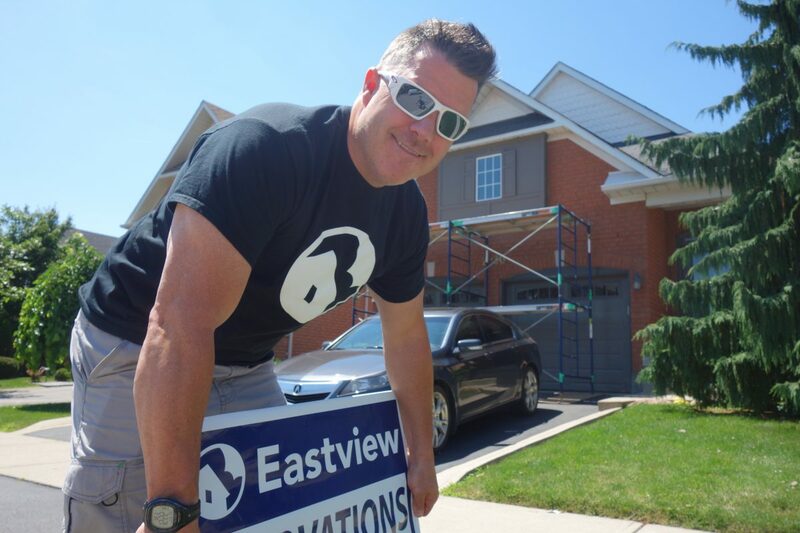 As this author toured a recent house flip, Keith Travers the Eastview Homes construction manager pointed out how old windows that were trendy when the house was first built, or when additions were made in the nineteen seventies now ‘date’ the domicile. Things have changed today, with modern thermal insulated glass windows coming in bigger sizes and offering much better temperature and audio barriers than ever before. The composition and character of modern windows has improved too, as bold new patterns inspire more comfortable spaces in the home. Octagonal window and small circular windows that were popular in the 1960s and 70s were used to let more light into rooms with tall ceilings or narrow room-transition walls as seen above. This was a remedy for dark rooms. You have to remember that very old homes had no windows in these short walls. The windows in exterior walls were in casings that were specially fitted with gaps to allow ‘storm windows’ to be applied in the winter. When these became highly unfashionable in the 1960s, as thermal insulated windows came on the market, homes were remodeled and builders added circular windows and other exotic shapes that were highly functional because they really did improve the light inside these old homes. This sunburst window was mainly used to draw attention to entrance ways or enlarge kitchen windows and was usually relegated to front foyers and hallways. It was sometimes combined with other window shapes like circles, ovals, triangles, eyebrows, trapezoids, and octagon windows, and that was primarily because of its ability to be adapted into any shape. Since half-moon or sunburst windows are not ‘operable’, and by that we mean it cannot be opened, closed or shuttered easily, it was not recommended for tall windows or for bedroom that occasionally need to be darkened. Its not recommended at all today by Keith Travers who has a special dislike for trendy building ‘fads’ that date a particular building. New windows work to prevent water, dust and intemperate air from entering the home. Look here below at this older shutter box which was leaking and the wood was rotting and worse, its bad design caused an irritating wind noise to whistle through the room inside. The window casing was removed and replaced entirely, although the new window was the same size and shape, the exterior casing was made bigger and less likely to catch the wind and make that irritating ‘wind-noise’. 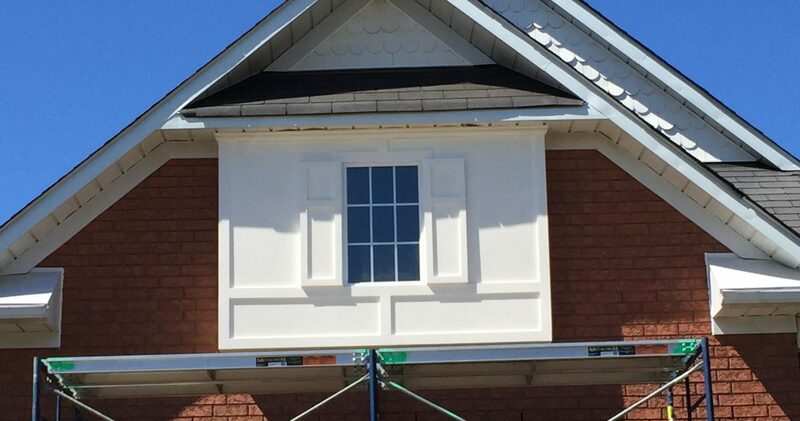 An easy job for Oakville Carpenter Keith Travers, the job was completed in two days and the scaffolding remained for two more days so the new facade could be painted. Below is the window back in place with a new white wooden casement. This wooden front-piece was then painted grey to better match the garage doors below and rest of the structure, and other garages in the neighbourhood. With this new window in place, the structure is more secure, saves money on heat and air conditioning bills and with its wider casement, the window box is more aerodynamic and therefore quieter in the wind. Eastview Homes standard window installation comes with two years workmanship warranty.